The Tomahawk Gas Scooter is the perfect alternative to the pocket bike. 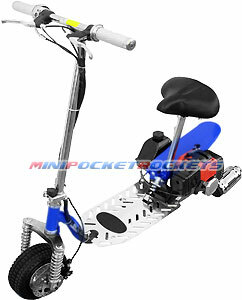 With an option to sit or stand on this gas-powered monster, you can use it for recreation as well as transportation. Furthermore, these scooters can be ridden anywhere, as local laws may allow these vehicles on most roads and sidewalks. And what if the road turns to dirt? Not a problem for the Tomahawk Gas Scooter. With its all-season, all-terrain knobby treaded tires, you can take your ride anywhere you want to go. The 43cc engine was designed to push the most out of its space-aged platform chassis. Front and adjustable rear suspension can be set for aggressive road carving or backroad comfort for whatever the path throws your way. The heavy-duty metal gas tank and torque-tuned engine straddles the rear mud guard for perfect balance and optimal traction, even in the wet. And the rear wheel chain drive was designed to operate even in the harshest weather and road conditions. Coupled with the race-ready front and rear cross-drilled disc brakes and you have yourself a top line gas scooter that can stop as fast as it can take off. Adjustability in the spring-loaded seat (you can also completely remove the seat), handlebars (folds down via quick-release for easy storage), brake levers, tire pressure, suspension and throttle response makes the Tomahawk Gas Scooter configurable to riders of any age, height and weight. Comes 99% assembled. The Tomahawk's built-in kickstand, semi-metal pull start and keyed ignition system makes it the perfect scooter for getting around town or just zooming past those battery-powered toy scooters! EPA APPROVED & CERTIFIED - OUR GAS SCOOTERS ARE LEGAL IN ALL 50 STATES! Included Free with Gas Scooter: Kick Stand, 1L Gas Mixture Bottle & Cap, Tools (sockets, screwdrivers, wrenches), Tool Case, Owner's Manual and our free extended warranty.